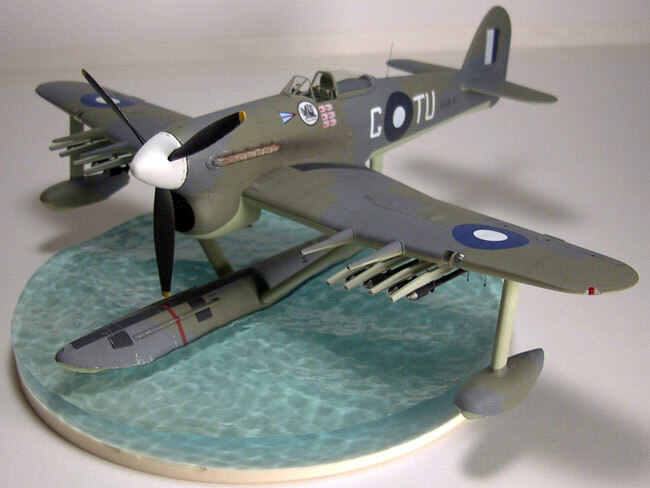 Derived from the Typhoon 1B, the little known Monsoon was developed to supplement the RAF Coastal Command’s flying boat fleet with a hard hitting fast attack fighter to counter the German E-Boat threat. Armed with 4 20mm cannons and 8 127mm rockets, the Monsoon was a very capable weapons platform. Unfortunately, under service conditions, a recurring problem soon became apparent. The very large chin radiator had a nasty habit of taking on water during take-offs and landings, which would create a dangerous nose heavy condition. This often led to the aircraft engaging in spectacular somersaults and cartwheels. Eventually all were retired and scrapped without a single example surviving. 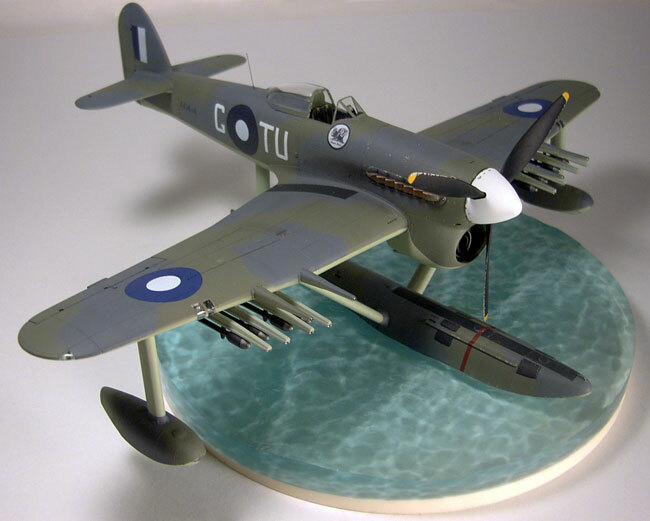 The aircraft modeled depicts one of 12 Monsoons delivered to the RAAF’s 107 Squadron to supplement their Vought OS2U Kingfishers in the anti-shipping role, the first hunter/killer team used in combat. 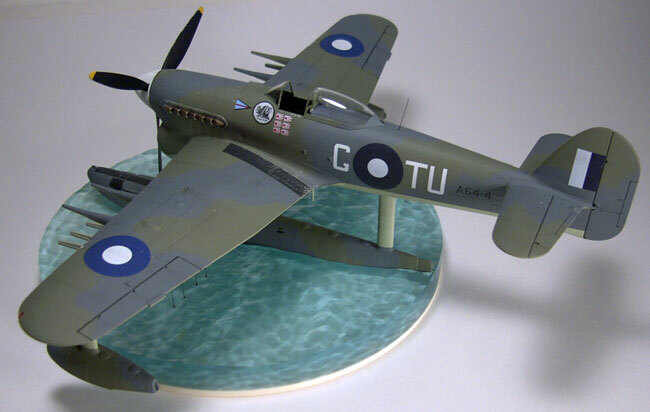 It was flown by Wing Commander G A “Tup” Tupper, one of Australia’s most colorful aces. His personal marking was a vulture with the motto “Watch This” inscribed beneath. 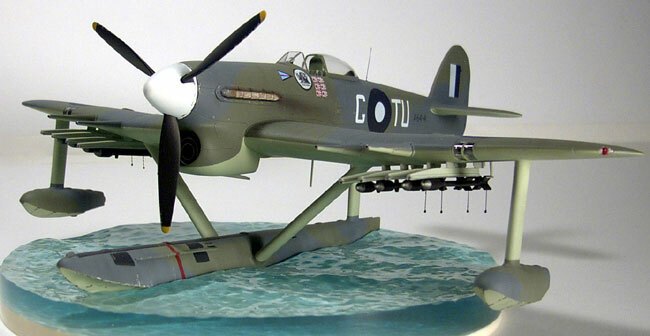 This project began with my model club’s group build featuring the Hasegawa 1/48 Hawker Typhoon Mk.1B kit. Since the Typhoon really didn’t sport many different color schemes during its service life, and I didn’t have much interest in adding a plane Jane gray/green over gray model to my collection, I decided to do something a little bit different. 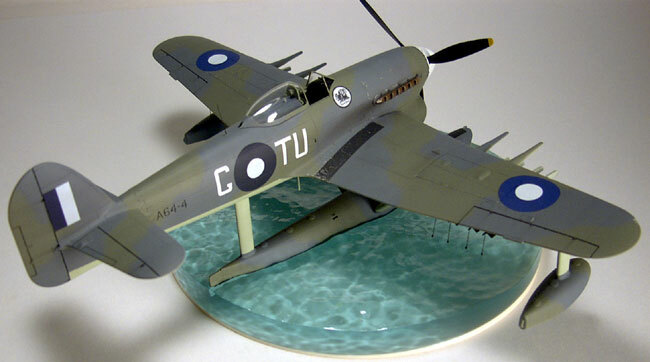 I happened to have a spare Monogram 1/48 OS2U Kingfisher kit minus wings. So I started sketching what a floatplane version of the Typhoon might look like. It pleased me enough to start cutting the floats off the Kingfisher and placing them with the fuselage of the Typhoon to get an idea of positioning, strut length and such. The first order of business was to eliminate the landing gear openings. This was done by grinding away the gear wells with a Dremel moto-tool and taping (from the outside) the gear doors in place flush with the wing surfaces. I then back filled the door area with one of my favorite modeling materials, dental acrylic. This liquid and powder mix yields a wonderful putty like material that can be spread onto styrene plastic and will harden to a very similar consistency. Next time you visit your dentist, inquire as to where he purchases this stuff and ask if he’ll order some for you. Dentists use it for creating temporary crowns and such. Anyhow, after the doors were firmly in place, I sanded down the outside of the wing and filled it with putty (I prefer 3M Blue Acryl Surface Putty) and got it as smooth as possible. I then re-scribed the panel lines to give the appearance that the doors never existed. I did this with a small metal ruler and a sewing pin chucked in a pin vise, and a lot of patience. The tail wheel opening was just filled with dental acrylic and sanded/filled/re-scribed in a similar fashion. Next I assembled the fuselage and wings. Then it was time to start the float strut placement and mounting. I drilled a 1/8 inch hole through the top and bottom of the fuselage halfway between the cockpit and tail and glued a piece of Evergreen 1/8 inch tubing in place. The top was filled with more (you guessed it) dental acrylic and sanded smooth. Then I located the area on the wings where the struts would mount and drilled more 1/8 inch holes through the bottom of the wing only. I then glued in more 1/8 inch tubing and cut it off flush with the bottom of the wing. To fashion the struts, I first cut a piece of 1/16 inch brass rod to the correct length for the fuselage strut and then soldered a piece of KB Brass airfoil tubing to it. When I had the float in place relative to the fuselage, I measured and cut some equal lengths of 1/16 inch brass rod and using some needle nose pliers bent the ends to match the angle that the strut would meet the surfaces. Again, I soldered some brass airfoil tubing to the rod filing the ends to match the angle as best I could. The wing tip floats were done basically the same way. At this point, I painted the entire model using Model Master Enamels. I decided to go with the maritime color scheme of Dark Slate Gray and Extra Dark Sea Gray over Sky for some variety. Then the model was sprayed with Polly Scale Clear Gloss in preparation for decaling. I decided to go with RAAF markings after reading about the 18 Kingfishers delivered to the RAAF for anti-submarine and shipping patrol. 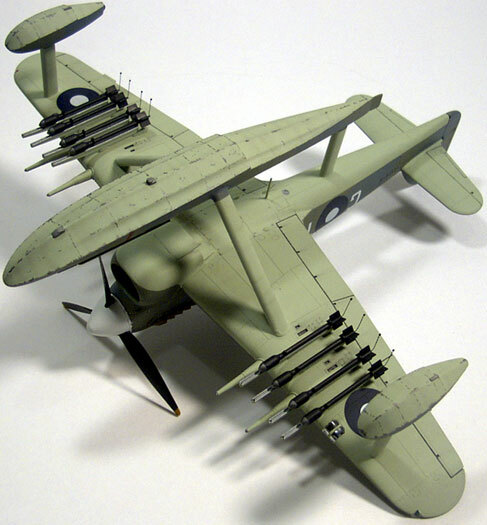 The decals came from a Suprescale International RAAF Spitfire sheet and an old Aeromaster PBY sheet. The serial number was obtained by cutting and re-placing the Spitfire codes and the A64 fuselage code was in fact an un-used RAAF code from WWII. 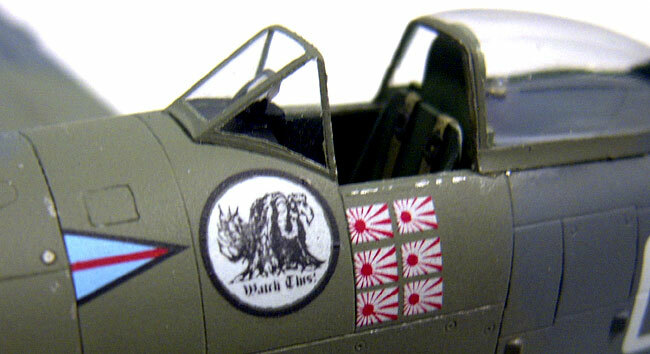 The Fuselage call letters were also cut and re-matched from the Spitfire decal sheet. The Vulture was printed from my computer from artwork created by the late George Tupper (Ming the Merciless to us Hyperscalerers), one of my club members who passed away last fall. I decided that since the Typhoon was one of his favorite aircraft, I would build this model as a tribute to him. Once all of the decaling was done the model was given a final coat of Polly Scale Clear Flat. The major components were then assembled and the final details were added, including antennas, rockets and canopy. Some weathering was added using Tamiya Metallic Gray and Testors Steel for the paint chipping and Floquil Grimy Black for the exhaust smudges. Since I am not a fan of the technique, no pre or post shading of any sort was done. The base was created by first sculpting the water with Kleen Klay brand modeling clay including the impression of the main float. From this an RTV Silicone rubber mold was poured. Into this mold, some clear casting resin slightly tinted turquoise in color using dye was cast. After this material cured some tan colored resin was poured on top of the clear to replicate the sandy bottom. This was then glossed up with automotive 2 part clear coat sprayed through my airbrush. When dry, this gives a very “wet look” appearance.